This high-quality PopUp gazebo is optimal for portable usage. Due to the particularly light aluminium frame it is easy to transport in the included carry bag. To ensure a high stability, the aluminium has been treated in an anodizing process and is therefore 15 times stronger than conventional aluminium. The vertical poles are made in a robust square profile with an edge length of 32mm and a wall thickness of 1mm. At the structure intersections, the roof frame is reinforced by robust nylon material. Several bolts and wing nuts are used to connect the frame parts allowing an easy replacement of all parts. The scissor type mechanism that folds the gazebo allows a quick assembly and dismantling of the product. The mechanism is then fixed by means of a clicking system. The roof tarpaulin consists of an approx. 300 g / m² heavy, PVC-coated high-performance polyester, which is 100% waterproof. The four side panels with large, rectangular windows can be installed or removed quickly. 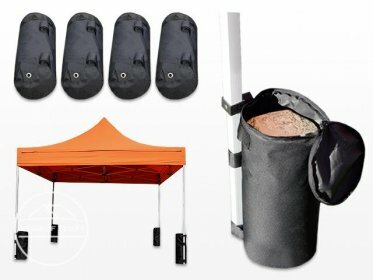 The PopUp gazebo is five-fold height adjustable and it comes in a robust carry bag.